While Neptune has a diameter 3.8 times that of Earth and a mass 17 times Earth's, the new world (named HAT-P-11b) is 4.7 times the size of Earth and has 25 Earth masses. The newfound world orbits very close to its star, revolving once every 4.88 days. As a result, it is baked to a temperature of around 1100 degrees F. The star itself is about three-fourths the size of our Sun and somewhat cooler. Astronomers have discovered a planet somewhat larger and more massive than Neptune orbiting a star 120 light-years from Earth. While Neptune has a diameter 3.8 times that of Earth and a mass 17 times Earth's, the new world (named HAT-P-11b) is 4.7 times the size of Earth and has 25 Earth masses. HAT-P-11b was discovered because it passes directly in front of its parent star, thereby blocking about 0.4 percent of the star's light. This periodic dimming, called a transit, was detected by a network of small, automated telescopes known as "HATNet," which is operated by the Harvard-Smithsonian Center for Astrophysics in Arizona and Hawaii. More than 300 extrasolar planets are now known to exist. 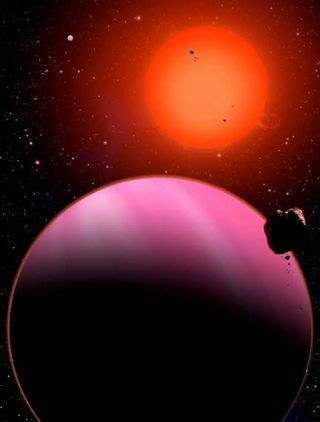 HAT-P-11b is the 11th extrasolar planet found by HATNet, and the smallest yet discovered by any of the several transit search projects underway around the world. Transit detections are particularly useful because the amount of dimming tells the astronomers how big the planet must be. By combining transit data with measurements of the star's "wobble" (radial velocity) made by large telescopes like Keck, astronomers can determine the mass of the planet. A number of Neptune-like planets have been found recently by radial velocity searches, but HAT-P-11b is only the second Neptune-like planet found to transit its star, thus permitting the precise determination of its mass and radius. The newfound world orbits very close to its star, revolving once every 4.88 days. As a result, it is baked to a temperature of around 1100 degrees F. The star itself is about three-fourths the size of our Sun and somewhat cooler. There are signs of a second planet in the HAT-P-11 system, but more radial velocity data are needed to confirm that and determine its properties. Another team has located one other transiting super-Neptune, known as GJ436b, around a different star. It was discovered by a radial velocity search and later found to have transits. "Having two such objects to compare helps astronomers to test theories of planetary structure and formation," said Harvard astronomer Gaspar Bakos, who led the discovery team. HAT-P-11 is in the constellation Cygnus, which puts in it the field of view of NASA's upcoming Kepler spacecraft. Kepler will search for extrasolar planets using the same transit technique pioneered by ground-based telescopes. This mission potentially could detect the first Earth-like world orbiting a distant star. "In addition, however, we expect Kepler to measure the detailed properties of HAT-P-11 with the extraordinary precision possible only from space," said Robert Noyes, another member of the discovery team.